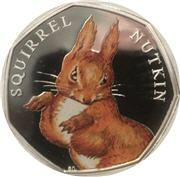 The first offering by the Royal Mint of Beatrix Potter coins were released in 2016 and featured Peter Rabbit, Jemima Puddle-Duck, Mrs. Tiggy-Winkle and this coin with Squirrel Nutkin. Housed in a Perspex block, this colourised silver proof version sold out very quickly. After 12 months the price has doubled. Reverse Designed by Emma Noble. The Obverse is a portrait of the Queen designed by Jody Clark. Mintage: 15,000 (may include coins issued as part of a set). Minted at The Royal Mint. Squirrel Nutkin 2016 silver proof 50 pence Royal Mint.